While I was growing up, I was lucky enough to have several adults in my life that were really inspiring. From my third grade teacher, Mrs. Johnstone, who taught me a love for storytelling, to my ninth grade English teacher, Mr. Nicholson, who was the first person to tell me I was good at writing. These people were a big part of what shaped who I’ve become. I’ve always loved films like Dead Poets Society, Mr. Holland’s Opus, and Freedom Writers that show how an adult who cares can leave a lasting mark on a kid’s life. I think those people really do exist. 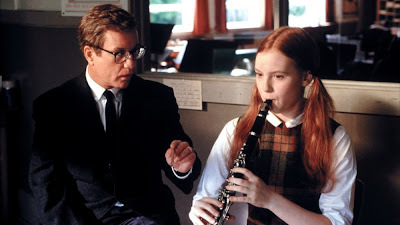 They’re not perfect, never as eloquent as in movies, and we don’t always appreciate their influence as it’s happening. But most of us have had at least one of those people in our lives. I see these leaders a lot in Science Fiction and Fantasy — Dumbledore, Gandalf, etc. — but rarely is Contemporary YA. I heard a literary agent (who will not named… partly because I can’t remember who it was) define YA as always having the adults in the background. I don’t think this is true at all. One of the biggest parts of being a teenager is how you interact with the adults in your life. I would love to read a Contemporary YA novel about the relationship between a kid and a parent, or a student and a teacher. There are a few out there, but it’s usually a subplot, never central to the storyline. Someone write one pretty please! I've had a lot of thoughts about the lack of mentors in YA - particularly those of the female persuasion. I'd really love to see more female teachers in both YA contemporary and fantasy. These teachers have been so important in my own life, and it would be nice to see their influence on YA protagonists. Thanks for this post! Great blog post. You're right about the influence of mentors for YA, and yes in life young adults are influenced by adults. I had two teachers in my life who inspired and challenged me, and if I stop and think about it, they were "subplots" in my "main life." They influenced me, but they were in and out of my life; I didn't interact with them a lot or think about them as much as other parts of my life. Yes, their influence was profound, but they were subplots. YA literature almost always is some form of coming of age story. 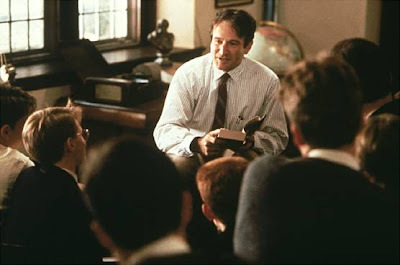 Dead Poets Society is one of my favorite movies, but unlike YA books, the story is as much about the teacher as about the boys. Adult influence as subplot: I think it works because their influence is profound. I always remember the art teacher in "Speak" by Laurie Anderson--he's very minor and only in a few scene, but he was the adult who saw her pain and offered her help. He's as unforgettable to the reader as he is the the protagonist. Such a great post! I actually haven't seen Dead Poets' Society (I know, I know) but I agree that there aren't enough inspiring/awesome adults featured in YA, not relative to the inspiring/awesome adults I see in real teen lives. Oh, there are tons of great adults in the Lumatere Chronicles by Melina Marchetta! And one awesome one in her contemporary, JELLICOE ROAD. I wonder if that's because she used to be a teacher herself? Just finished reading Colleen Hoover's "Slammed," and protag's two main mentors (her boyfriend, who she learns is her teacher, and her mom who is dying of cancer). Adult influence is intertwined with main plot, but nevertheless, it is not subplot.